Cartoon Light Bulb Mascot Clip Art Cartoon Characters! Cartoon Light Bulb Clip Art! Looking for a Cartoon Light Bulb Mascot? Well, you've come to the right place! My Light Bulb Character would make a great mascot for your special event, website, school, blog, or business. He's currently available for royalty-free licensing in the poses listed on this page, which you can view and purchase individually by clicking on the thumbnail images below. If you need this Cartoon Light Bulb Character with a prop or pose not found here, please feel free to contact me with your specific request so I can create it and add it to the collection! [UPDATE!] 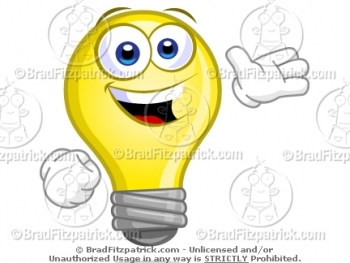 This Light Bulb character is now available for puchase in a clipart value pack! My vector clipart packs offer significant savings for you if you'd like to use the same mascot in different poses for multiple purposes throughout your projects. Cartoon Light Bulb Clipart - Cartoon Light Bulbs - Light Bulb Mascot Clip Art Characters! Please be sure to bookmark this page and check back often because I'll be constantly updating this category with more poses and illustrations of this Cartoon Light Bulb Character as they become available. Thanks!